Nothing brightens up the holidays quite like candles. Find out everything you wanted to know about candle care in this post. On the hunt for the best-ever holiday gift to give to that extra-special someone? Consider this candle and gift card combo. Pre-packaged in a box featuring the bright, whimsical designs of Montreal-born-and-based illustrator Cécile Gariépy (who we'll be profiling in a future blog post at a later date - stay tuned!) is a scented candle in bronze holder with gift card valued at $150. It’s bound to be a universally-pleasing pick that everyone on your shopping list will enjoy, from the hygge-loving hibernator to the interior design diehard. 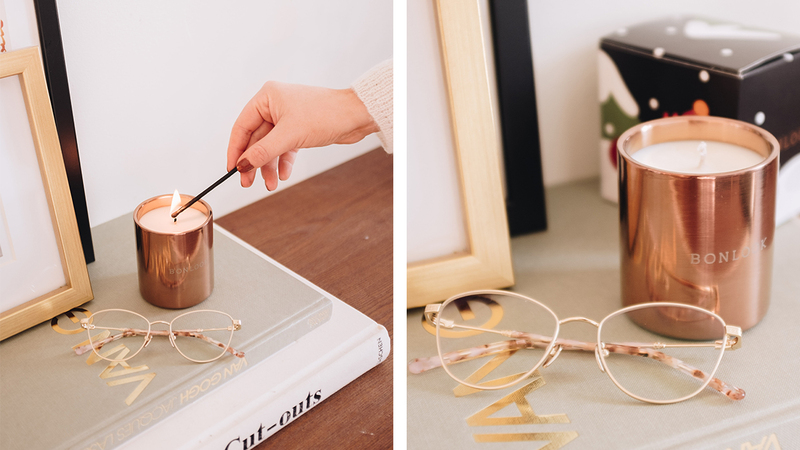 You already know they’ve been eyeing a new pair of glasses—that’s what the gift card is for—but with a scented candle thrown into the mix, you’re sure to brighten up their holidays too. According to the National Candle Association, three-quarters of people who purchase candles as gifts do so because they’d enjoy receiving one themselves. That’s because candles are thoughtful and comforting. The gift of a candle is something they will surely treasure for a long time (if taken proper care of, that is). If you’re planning on picking up our special holiday gift set, then read these guidelines on candle care first. 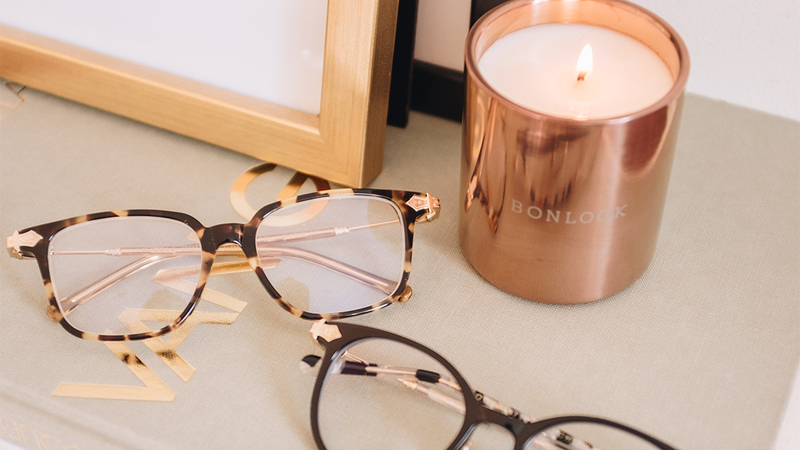 Here, we’ll go over the fine art of lighting and loving candles and what steps you or your giftee should take to extend your BonLook candle’s life. Your candle’s flame should never seem incensed: you don’t want it to flicker, sputter, or smoke. If you hear a slight crackling sound, then that means something's up with the candle, as a flame should always sit still. It should always be teardrop-shaped too. One easy way to curb this is by trimming the wick (more on that below). Skip the scented candle during dinnertime because the fragrances released by your candle can mix and mingle with the smell from your meal, which impacts the way it tastes. Your guests might not enjoy the extra "seasoning". Instead, light it well after you've eaten dessert to enjoy the cozy mood the candle will set. To get the most out of your candle, trim the wick prior to every use, including the very first time you light it. You should always keep the wick short: it should measure approximately a quarter of an inch to a half-an-inch in length. Candle connoisseurs recommend this because a short wick allows the melted wax on the surface of the candle to feed the flame. Left untrimmed and a lengthy wick causes the flame to react, rousing unwanted side effects like soot and a smoky odor. This tarnishes the clean surface of your candle and can stain your fingers and clothing if touched. Your candle may look lovely sitting atop a mantel or bedside table, but just remember that as picture-perfect and "Pinterest-worthy" as it may look, a candle still has an open flame which is a fire hazard. For safe candle consumption, never leave a lit candle unattended, especially if there are small children or pets in the vicinity. Also, never light a candle in a drafty room as you don’t want the flame to spread and catch fire. Once it comes time to extinguish your candle, you know the drill—just blow it out, right? Wrong! What you should be doing instead is using a tool called a snuffer which is a long handle with a cone at the tip. The snuffer cups the flame which deprives it of oxygen and puts it out. The candle wax will melt evenly the next time it is lit. 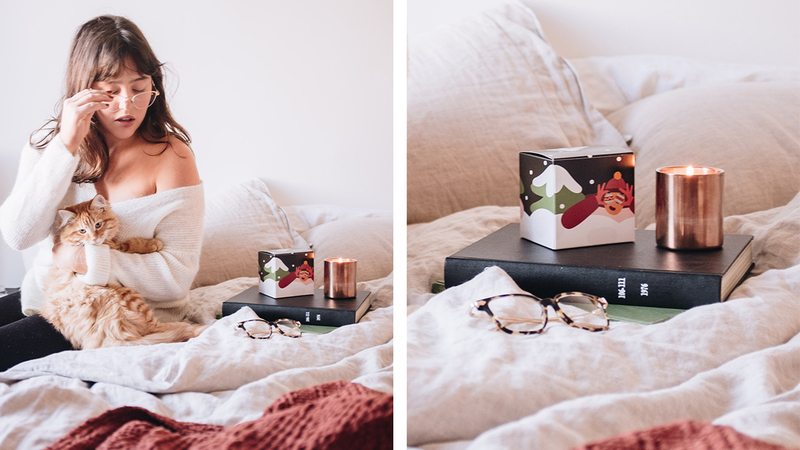 By following these tips and tricks, this BonLook candle will reward you by lasting well after the holidays into the chilly months of winter.